Christine and her husband Nick founded A21, an anti-human trafficking organization dedicated to abolishing injustice in the 21st century. Of course people pervert His Gospel saying the exact opposite and say that He came to reform the world and that He came to improve it. That Christianity is going to put an end to war. He’s never said it and it is nowhere in the New Testament. … In the last days perilous times shall come. ~Martyn Lloyd Jones, sermon Facing the Facts, Acts 8:4-5. Whenever we take our eyes off Jesus and follow temporal pursuits, we enter dangerous territory. Seeking social justice, financial prosperity, personal career fulfillment, spiritual knowledge, (social justice gospel, prosperity gospel, purpose driven gospel, Gnostic gospel) or any of the other ‘gospels’ popular today will only lead to discouragement and defeat. The poor you will always have with you, but you will not always have me. (Matthew 26:11). Attempting to alleviate poverty in this world, or at least, trying to equalize “injustice” (i.e. some people are richer than others) is an endeavor doomed to fail. Even as an unsaved person I used to wonder why that throughout history the same problems repeated. Poverty, war, abuse, squalor, disease, tyranny &etc. were always present somewhere at some point on earth. No culture had ever been immune from any of these things. Ever. These endeavors are doomed to fail because the root cause of these issues is not poverty, war, disease, squalor etc, it’s sin. Sin is the problem. Sin is a problem we cannot solve. Sin is a problem that is inside us and the solution can only come from outside of us. Therefore, only Jesus can solve sin and the solution is salvation via the Holy Spirit, at God’s effectual call. Our Triune God resolves the sin issue and once solved, we share the Gospel with others in order to apply the solution, which the Spirit applies at His discretion. (John 3:8). The worse a national situation becomes, the more we yearn for someone to come along and fix it. Nobody likes problems, we all want the country to work smoothly. Because the nations do not look above for help, they look to another man. The worse things are, the harder they look for a human savior. We know this because at the time of the end, the nations look to the antichrist and pin all hopes on him. (Revelation 13:1-18, Daniel 11:36). For a while he will prosper. But in the very end, he will come to nothing. (Daniel 11:45b). Looking to a man (or a woman) to solve national ills is just as futile as looking to Christian Caine’s organization to wipe out human trafficking. By the way, read Revelation 18 ad you will see that even until the very last moment of human history in this age, there will be human trafficking. If Caine just reads Revelation 18:13 she will see her organization A21 is doomed to fail. Her eyes are not on Jesus, or she would know that. We know that the unsaved, natural man looks to other men for solutions to the problems of poverty, spiritual drought, life’s purpose and meaning… But even Christians are seeming to lose their minds with this latest election cycle. We feel pushed into a corner, with no options. The one main candidate is a criminal horror, the other main candidate is an amoral pig. Some say that voting for a non-main candidate is wasting our vote. What to do? Our vote is not Willy Wonka’s Golden Ticket. 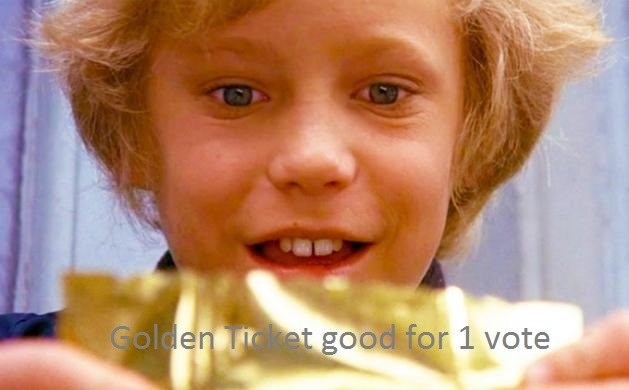 We have our golden ticket. It’s salvation, forgiveness of sins, and entry into Jesus’ kingdom. This world is not our home. It’s not the only precious thing we possess. Our vote is not the entry into a candyland kingdom where rainbows gleam and unicorns cavort. Where bureaucracies work and politics has integrity. A vote is a political privilege and a civic duty that comes around every few years and nothing more. Voting is an activity. It’s not a solution. Next, remember that God ordains each and every leader for each and every country. He even ordains the times and boundaries of each nation’s life! (Acts 17:26). How long has America been America? Since 1620? Since before that when Native Americans thrived here? Since 1776? How often did the boundaries change during the early centuries of America’s life? They changed in 1782, 1803, 1818, 1819, 1820, 1845, 1846, 1848, 1853, 1862, 1867, 1898, 1925, when major tracts were bought or won or exchanged between sovereign nations, such as the Louisiana purchase or the Texas territory. America’s borders changed in the following years as each state was admitted to the union, 1787, 1788, 1789, 1790, 1791, 1792, 1796, 1803, 1812, 1816, 1817, 1818, 1819, 1820, 1821, 1837, 1845, 1846, 1848, 1850, 1858, 1859, 1861, 1863, 1864, 1867, 1876, 1889, 1890, 1896, 1907, 1912, 1959. And anyone who has traveled our southern border in recent decades knows that the Rio Grande is simply a river. The river might show on maps as a border, but effectively, there is no border at that spot. The mixing and melding of Mexico and the US extends for at least 50 miles north or more into the southern states. Therefore we ask, what is a country? Simply a piece of land on which people live and over whom God assigns a ruler for a period of time. What is a border? A line on a piece of paper which may or may not be respected. When the Soviet Union fell, new nations were being born and new borders being drawn every week, it seemed like. As for the leaders of these ever-changing countries, do we think that Bill Clinton’s Presidency was an accident? Or George Washington’s? Italy has had three presidents in 2015 alone. And so it goes. God ordains it all. He changes times and seasons; he removes kings and sets up kings; he gives wisdom to the wise and knowledge to those who have understanding; (Daniel 2:21). I’ve observed that as we are pushed into a bad corner with insurmountably soul-wrenching political choices, Christians have seemed to lose their minds regarding this election. The debates, the campaign, the dirty tricks, the tapes surfacing, the criminal allegations, the woeful hand-wringing, are just so oft-putting. It tarnishes our Savior’s name to be in such hysteria. It’s a blot to be so totally focused on it. None of these various gospels such as social gospel, prosperity gospel, or political gospel are the solution. As a matter of fact if you have to put an adjective in front of the word gospel, it’s no gospel at all. Don’t put your eyes on the political solution. Don’t go crazy over what is said at Presidential candidate debates or pick over the details of an audio tape surfacing, or the worry about the minutiae of campaign that has already grown grotesque and evil. As a matter or fact, tomorrow I’ll look at Isaiah 3, God’s forewarning about His judgment upon Judah. I’ll finish that part with showing that through prophecy we can gain comfort, even if it’s a judging prophecy. Until then, stay the course. The Gospel course.